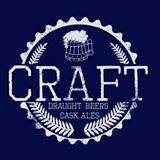 CRAFT (981 Silom) 1st anniversary is coming up! ▶ Buy 2 get 1 free for selected kegs and bottles from 8 - 10pm. ▶ Don’t miss out on their newcomer band, Double Boom who will be playing from 6 to 8pm. ▶ UEFA England-Wales match from 8pm onwards, for the football lovers among you. ▶ We have a DIY booth for you to be creative and transform your beer bottles into something cool! We’re excited to see your creations. ▶ Try out new beers at our beer tasting booth. ▶ Pie or Burgers with every Beer you buy. Save the date – invite your friends!